Yes, I know these are neither foraged pumpkins nor are there wild animals in the soup. But remember this blog does have the word “gardener” in it, and I still garden, if less strenuously than in earlier years. One thing I still do grow are squashes. I love winter squashes, and have been on a quest to find the perfect one: Bright orange inside, with tasty seeds and that can keep for months without rotting. This year I grew an Italian chiogga squash, which is a kind of kabocha; green and warty, with yellow flesh. Not bad, but not my favorite. I’ve grown Navajo pumpkins and Long Island cheese pumpkins and real kabochas from Japan. But so far, I still prefer the common butternut squash. I love the color, the flavor how dry it is and how long it keeps. 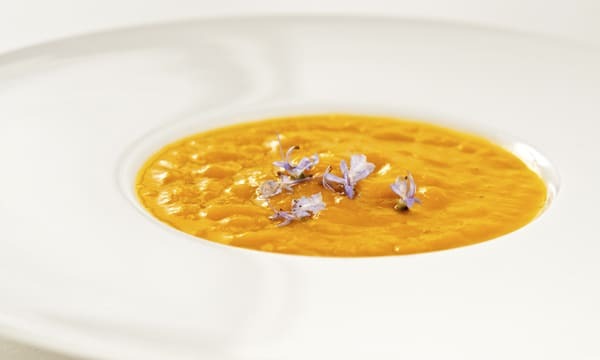 This soup is made with butternut. You can choose your own favorite squash. As for the bacon, any will do, but I like to use my homemade bacon, which is easy to make and, well, makes this soup feel more real to me. There are a million recipes for pumpkin or squash soup on the Internet, but I'd like to think mine is a little different -- thanks to bacon and creme fraiche or sour cream. I use either smoked or unsmoked bacon and butternut squash for this recipe, but you can use other squash or pumpkin, too. Remember however that pumpkin is more watery than butternut squash, and that smoked bacon can be overpowering. Salt pork is an excellent substitute for unsmoked bacon. This soup will last for 3 to 4 days in the fridge, so you can make a double batch if you want. Peel the squash, scrape out the insides and chop it into chunks. In a large pot, heat the butter over medium-high heat and add the onions and bacon. Cook, stirring often, until the onions are translucent. You don't want them browning. Pour in the stock, add the squash, bay leaves and a healthy pinch of salt. Bring to a boil. Turn the heat to low, cover and simmer gently for an hour. Stir it once or twice in that time. 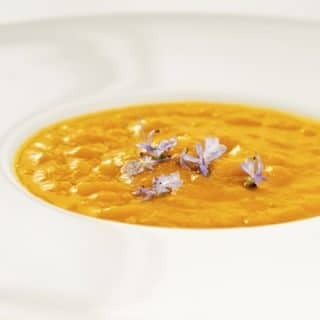 Uncover the pot, remove the bay leaves and puree the soup, either with an immersion blender, by moving the soup to a blender or a food processor, or by pushing it through a food mill. An immersion blender will give you a slightly chunky soup, a blender the smoothest. Return the soup to the pot, put the bay leaves back in and simmer, uncovered, for another 15 minutes. Stir frequently to keep it from sticking on the bottom. Add salt to taste. Right before you serve, whisk in the creme fraiche. Garnish with chives or rosemary flowers if you have them. Well done!!! I made this recipe with Pumpkin this weekend. It was awesome!!! Made this one yesterday exactly as written. Fresh squash & onions from the garden and homemade bacon ends/pieces hot off the smoker. AMBROSIA!